“All Roads Lead…” is a rather aptly titled episode of Agents of S.H.I.E.L.D., because as the finale draws closer so does the apparent inevitability of the Destroyer of Worlds prophecy. And the most interesting part of all is that once more the worst actions are taken by those who are simply protecting the ones they love. Talbot is now fully “happy to comply” and under Hydra’s command, Winter Soldier-style. He walks into an armory and takes a gun, though he assures himself nobody has to get hurt. Already we see that he is wrestling with himself and his orders, which makes the events even more stressful to watch unfold. His plan to kidnap Robin Hinton as quickly and painlessly as possible is sidetracked by Mack’s (Henry Simmons) concern for his well being, but thankfully he can control himself enough not to hurt his friend. In fact, not hurting his friends seems to be his undoing, but before we get into that we have to talk about the romance in the air – or not – for said friends. Coulson (Clark Gregg) finally has something to say about May’s (Ming-Na Wen) confession of love, but now she’s more interested in grabbing Gravitonium and saving the world. Then there’s Deke (Jeff Ward), whose sudden eager-to-obey attitude in light of Daisy’s (Chloe Bennet) leadership has not gone unnoticed by the others. This leads to an enjoyable group scene in which Coulson and Mack fail to give Deke any useful advice on handling his crush, considering that both of their romances are in shambles, and instead agree that leaving lemons on her bunk is the only way to go. “All Roads Lead…” is such a bleak episode that these moments of levity are much appreciated, and certainly help to break up the monotony that might otherwise crush such an intricate plot. 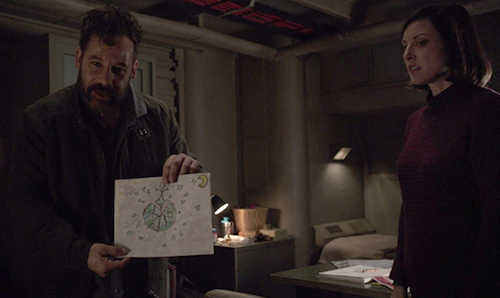 Glenn makes it to Robin’s room and digs through her drawings, managing to keep his cool in front of the little girl and her mother until he lands on one picture in particular. It appears to be the Gravitonium voices bubbling inside its user, but I’m not the clairvoyant here. Nevertheless, it causes Talbot to launch full-force into the mission, take out Polly and grab an all-too-willing Robin. If anything, Polly calling for her daughter get help to no avail was the most painful part of all, because Robin knows everything and yet still finds herself helpless to prevent it. Coulson and Mack figure out something’s wrong just in time, and the power of friendship is used against Talbot’s programming to great effect. Coulson knows his friend will do anything not to hurt him, and Mack is willing to take Talbot out before he does irreparable damage to himself. But what if he had gone through with his mission? Is it possible he could have prevented the events of the other half of “All Roads Lead…”, even if it was in service of evil rather than good? 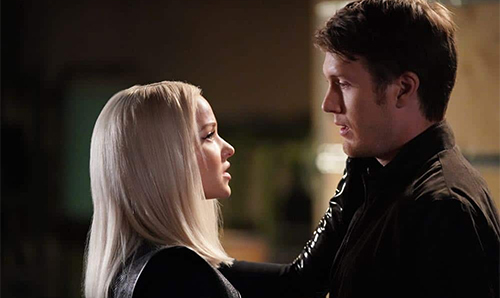 Ruby (Dove Cameron) is having a great time throwing knives at Jemma’s (Elizabeth Henstridge) face to motivate Fitz (Iain De Caestecker), but she needs to let the lovebirds work together if she wants to see results. Right off the bat, “All Roads Lead…” telegraphs its theme by having Jemma and Fitz discuss how willing they are to save each other at the cost of the world. It’s a little on the nose, but their self-awareness is refreshing. In a moment that was halfway between creepy and cute, Ruby even tries to mimic the married couple’s public displays of affection when Stucker returns with an update on their mission to become one with Gravitonium. Scenes like this highlight how removed she is from humanity, and yet how different she might be if she had been raised elsewhere. Speaking of that Gravitonium, it’s too bad she’s not around when Hale checks on Creel. If she paid attention to how he was holding up, she’d know she really doesn’t want to be infused with the screaming voices of all its victims. But at least Hale knows, which is why she interrupts a totally badass fight sequence in order to surrender to May and Daisy for the sake of her daughter. She warns them that Ruby is about to become the Destroyer of Worlds and kill their friends once she succeeds, and suddenly their mission becomes all the more urgent. Unfortunately, they’re a step later than Coulson was with Talbot, and the process has already begun. With 8% of the Gravitonium in her system, Ruby can levitate for starters. And accidentally kill her boyfriend without even touching him. She does not react kindly to this development, and her breakdown is horrifying and heartbreaking to watch. Even worse is the dreaded feeling that the only way to save everyone in the room may be exactly what sets off the end of the world. Ruby tries crushing Daisy in her fear and rage, but once again her mother’s voice brings her back from the brink. The love of a mother and child, as warped as this pair are, could still be enough… Unless it’s counteracted by another person’s misguided fear and love. Which is exactly what happens when Yo-Yo (Natalia Cordova-Buckley) makes it to them. Seeing Ruby is as triggering for her as the Gravitonium is for Ruby, and a moment that could have been heartwarming instead ends with Ruby’s throat slashed thanks to Yo-Yo’s powers. Though she is convinced she saved the world, the final scene seems to disagree with her. Hale reports back to her alien overlords with the location of the Gravitonium and no reason left in the world to save it, which is bad news for everyone else. And so “All Roads Lead…” laid out the ways love powers us to good and evil in equal measure, because what motivates humans is often each other and not the loftier ideals they strive towards. Hale’s love for her daughter led both to her teaming up with S.H.I.E.L.D. and to betraying them with no discrimination, Fitzsimmons will choose each other other the world, and even Talbot would rather end his life than hurt his friend. Even Strucker’s pain at the sound of Ruby’s screams was more real than any steps he took to ensure her super soldier dreams. Now can Agents of S.H.I.E.L.D. remind us that love can save the world sometimes too? Just saying, we’ve got 4 episodes left and I’m real nervous.